It’s festive. It’s sweet. It’s Halloweeny. 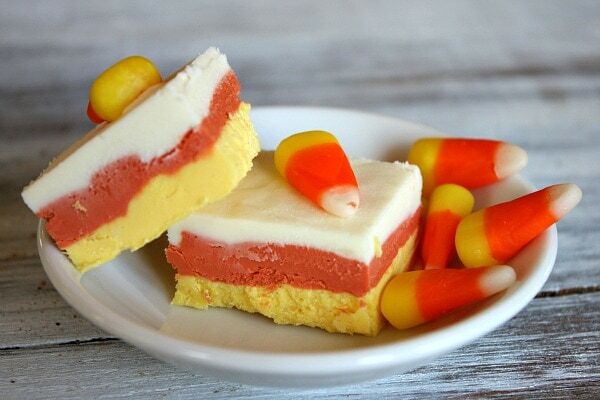 It’s candy corn fudge! Don’t get too excited. It actually doesn’t taste a thing like candy corn. But it’s cute, right? That’s all that matters at Halloween. People take the cute stuff off the table first. People praise the people who bring the cute stuff to a party first. And kids go bonkers over cute stuff too. Don’t worry… it’s good. It just doesn’t taste like candy corn. 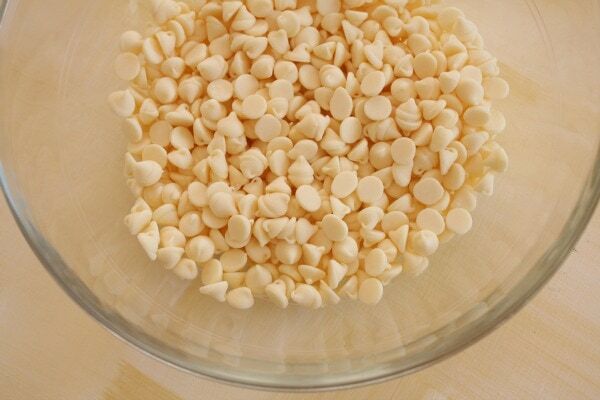 Toss the vanilla chips in a big bowl. Microwave them until they kind of melt. I say “kind-of” because if you’ve ever worked with vanilla chips, you’ll know that they don’t really melt like chocolate does. Just melt them until they can mash together. Like the photo shows. 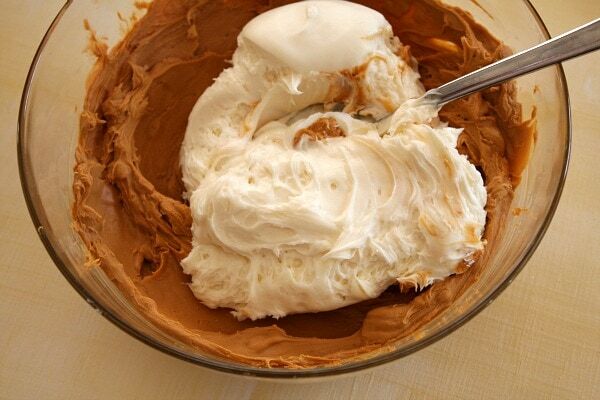 Add a can of frosting and mix it up. The texture will be much better after you do that. 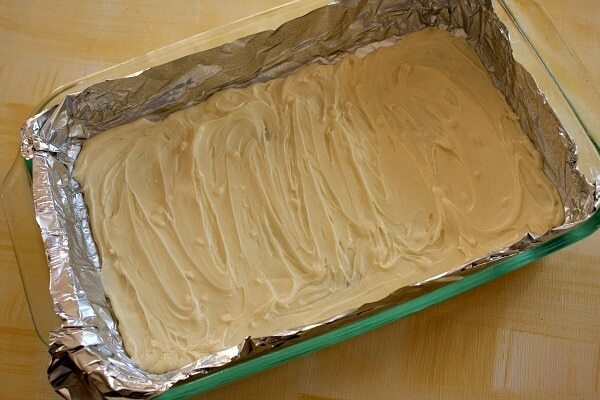 Spread just a third of the vanilla-frosting mixture into the bottom of a greased-foil-lined pan. Toss butterscotch chips in another bowl. Microwave and do the same thing. You’ll get similar results with the butterscotch chips in terms of melting. Just mash them up. Add a can of frosting and stir. Stir that all up and hopefully you’ll get the color you were looking for. I might have added a few more drops of red to this, had I not been trying to catch up on Gossip Girl while preparing the fudge. There are some exciting things going on that there show- my guilty, silly pleasure. 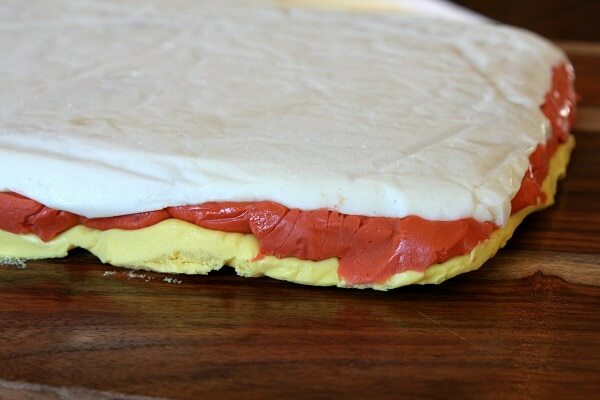 Spread the orange layer on top of the white layer. Then take the remaining frosting/vanilla chip mixture and add yellow food coloring to it. Yellow + white = well… yellow. Again, if you don’t like the yellow that you got, add a few drops more. I liked my yellow. 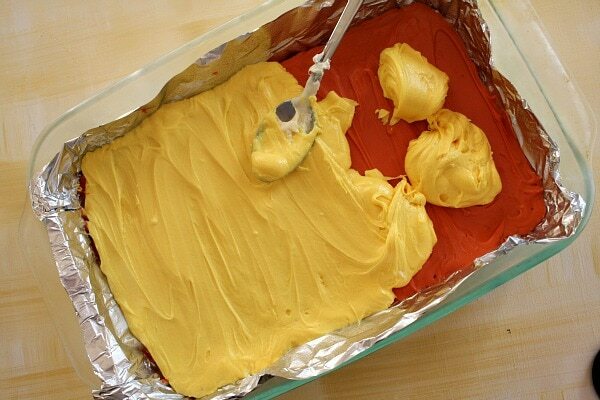 Spread the yellow layer over the orange. Then refrigerate the whole thing until it is firm (an hour or so). 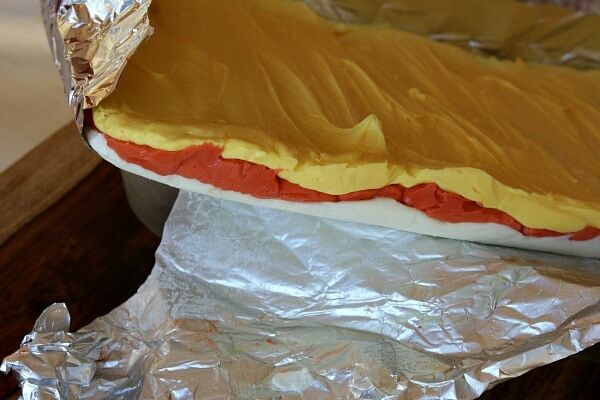 Lift the whole thing out of the pan and carefully turn it over onto a cutting board, peeling away the foil. …I went ahead and cut neat sides all the way around (and just tossed the scraps). Now get out that beautiful candy corn. Look through the bag until you find the pieces that are whole and not cracked or funky or rejects or whatever. You want the perfect ones. 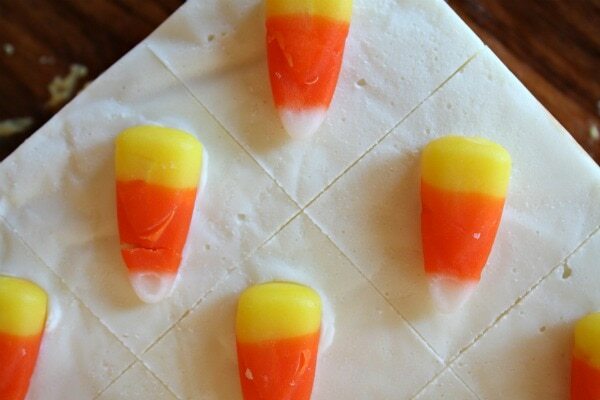 Place the candy corn in even rows on top of your fudge. All nice and pretty and obsessively straight and perfect like this. Oh My. 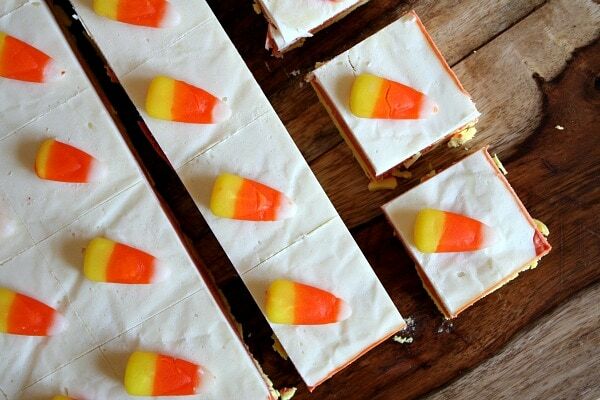 I see a imperfect candy corn on my fudge. What the heck?! Take a sharp knife and lightly score the top of the fudge where you would like the cuts to be. Measure with a ruler if you want to be perfect. 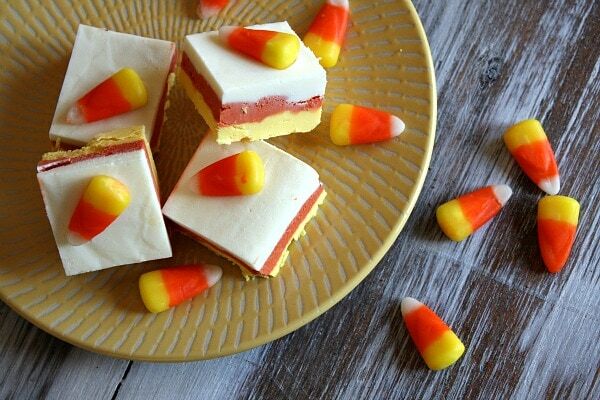 Gently press each candy corn into the top of the fudge. Don’t press too hard… or you’ll end up with whacked-up candy corn. Start cutting on the scored lines. Have plenty of paper towels handy as you’ll want to wipe your knife after each cut so that you don’t transfer any of the color into the next cut. Refrigerate these guys until you’re ready to serve them. I thought they turned out festive and pretty. 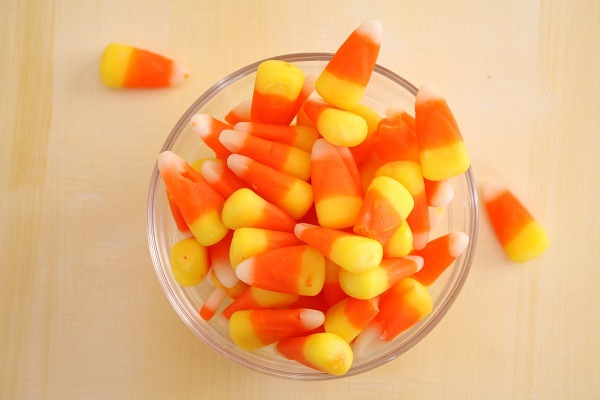 As I said way back when at the beginning of this post, they don’t taste like candy corn. Since they’re made out of melted chips and frosting, they taste like… chips and frosting. They’re sweet. I ate a piece and enjoyed it. But one piece is enough. Which means they’ll work out great on a Halloween buffet table. You likely won’t see anyone downing one right after the other. And if you do… ew on that guy. Enjoy your Halloween parties! Will you be making something festive? 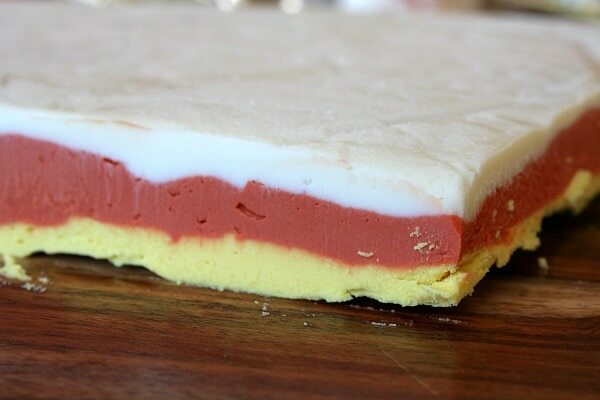 Fun and easy recipe for candy corn- colored "fudge." 1. Line a 13x9-inch pan with foil. Spray lightly with nonstick spray. 2. 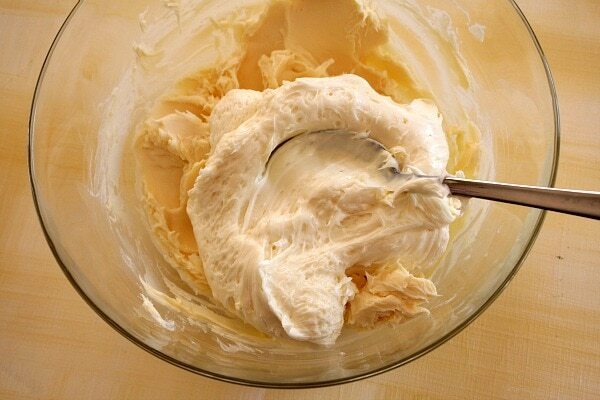 Prepare the first layer: Pour vanilla chips into a large bowl. Melt in the microwave (or over a bowl of simmering water) until the chips are melted and somewhat smooth. In the microwave, set it for one minute, then stir. Then 30 more seconds, stir again. It should take about 2 minutes to get them melted and smooth. 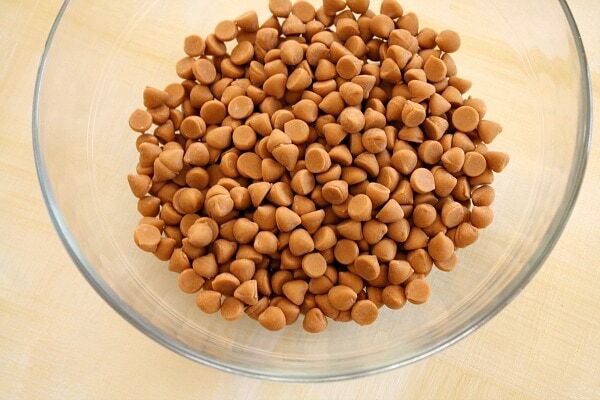 They won't be smooth like melted chocolate, just smooth enough to mash around (as in photos above). Don't over-cook them or they will begin to harden again. Immediately stir in one can of frosting. Stir until it is smooth and incorporated. Spread a third of the white mixture into the bottom of the prepared pan. Set the rest aside for now. Place the pan with white frosting in the refrigerator while you prepare the next layer (or freezer, if there is room). 3. 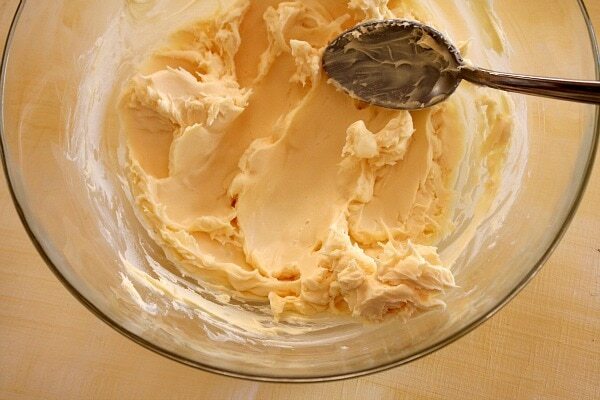 Prepare the second layer: In another large bowl, melt butterscotch chips the same as indicated in step 2. 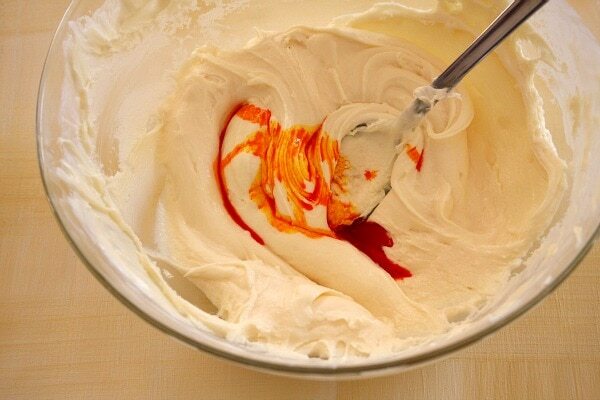 Then mix in the second can of frosting. 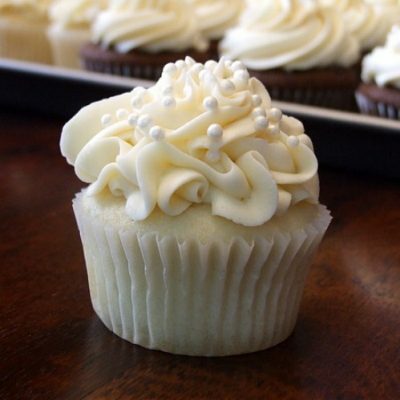 Mix well, until you can no longer see any white frosting streaks. 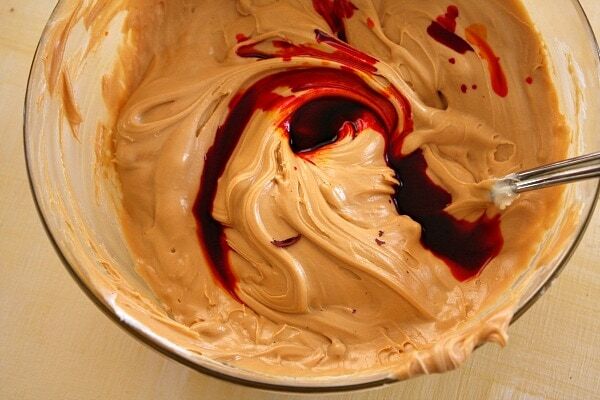 Add 1/2 teaspoon yellow food coloring and 1/2 teaspoon red food coloring. 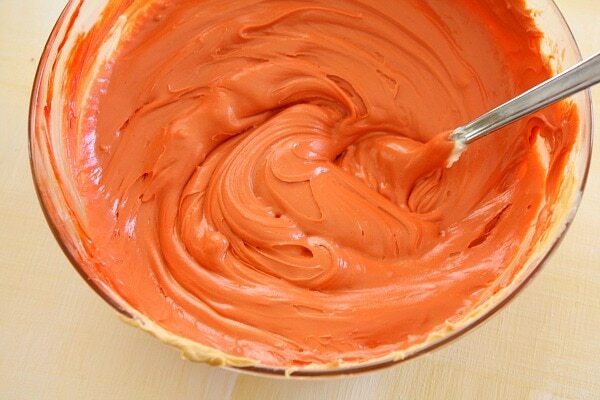 Stir until the colors are incorporated and the mixture looks uniformly orange. 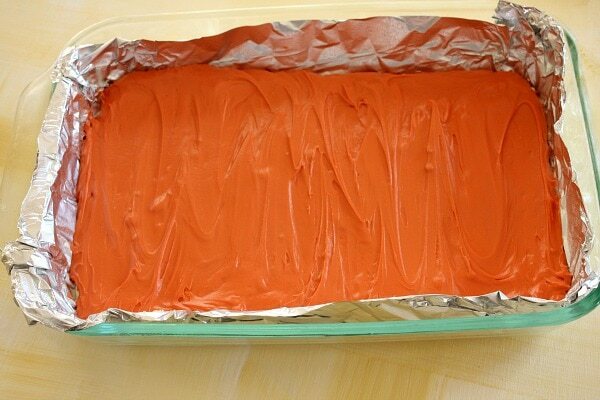 Spread the orange layer evenly on top of the white layer in the pan. Return to the refrigerator or freezer. 4. 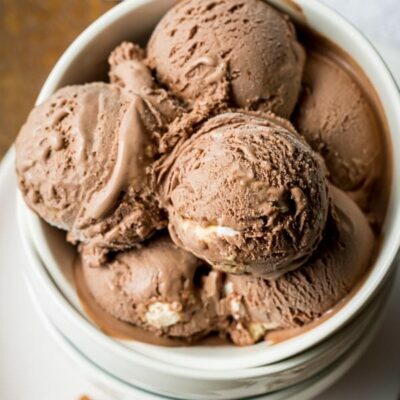 Prepare the third layer: If the remaining 2/3 of the white mixture has begun to harden, heat it up in the microwave again (or over simmering water) until it is melted and smooth again. 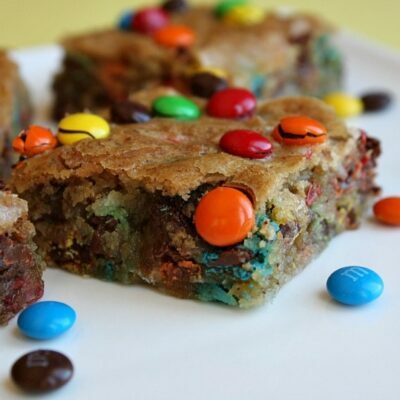 Add 1/4 teaspoon yellow food coloring. 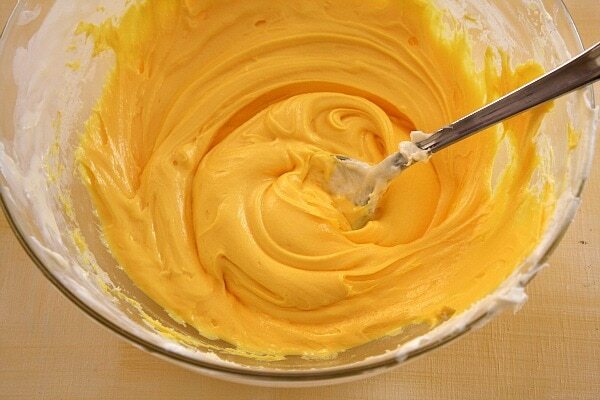 Stir until the mixture is bright yellow and well blended. 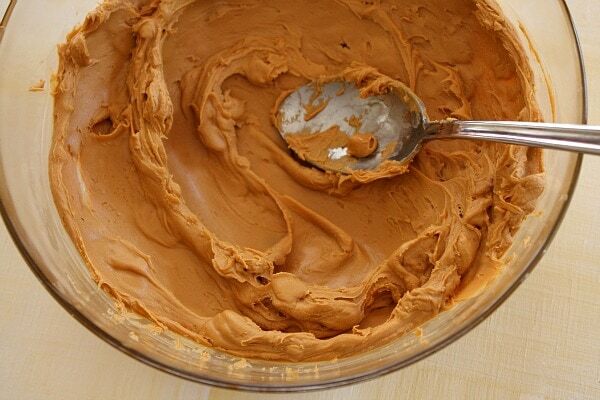 Spread over the orange layer in the pan. 5. Refrigerate the pan for 1 hour, or until it is firm (overnight is fine). 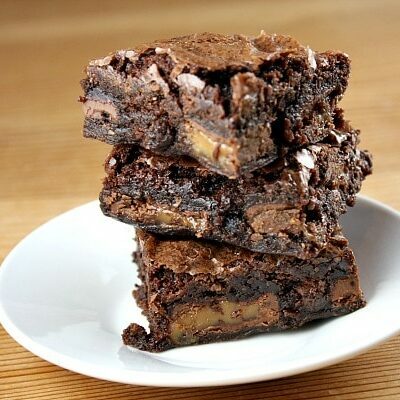 Use foil to lift the fudge from the pan. Turn it out onto a cutting board, white-side-up; peel off foil. 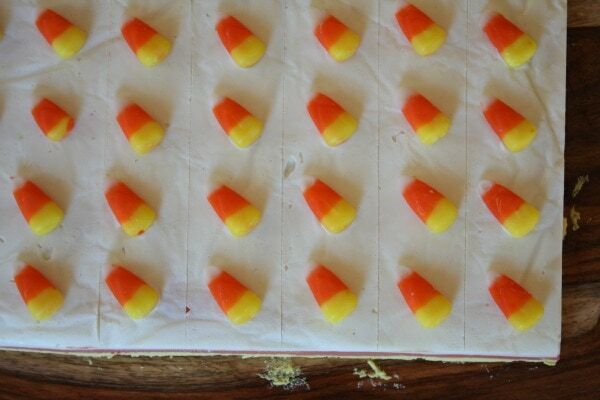 Place the candy corns where you'd like them (in even rows) on the fudge (see photos). Don't press them into the fudge quite yet. Use a long, sharp knife to "score" the fudge (see *Tips below). 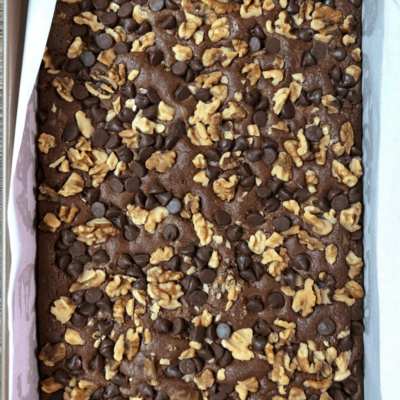 Let the fudge sit at room temperature for 15 to 20 minutes, or until it has had a chance to soften slightly. 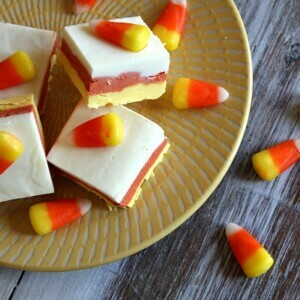 Press each candy corn lightly into the fudge. It does not have to be buried, just pushed in slightly to stick. Push too hard and you will crack the fudge! 6. Cutting the fudge: Here are some tips... You can go ahead and cut the fudge at this point if you'd like. If you do, have a few paper towels nearby. You'll want to wipe the knife clean after each cut so that you don't bring any of the color that is left behind into your other cuts. Or you can place the fudge back into the refrigerator and let it sit there and get chilly for an hour or two, then use your sharp knife to cut the fudge. I always find that when things are nice and chilled, you get cleaner cuts (still wipe the knife between cuts though). 7. 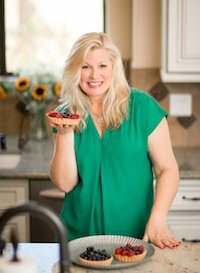 Serving the fudge: Serve and eat right away. Or store in the refrigerator in a covered container until you're ready to serve it. If you pile them into a plastic container, just be sure to make one even layer on the bottom, then place a piece of waxed paper on top of that, make another layer, then more waxed paper. You get the idea. 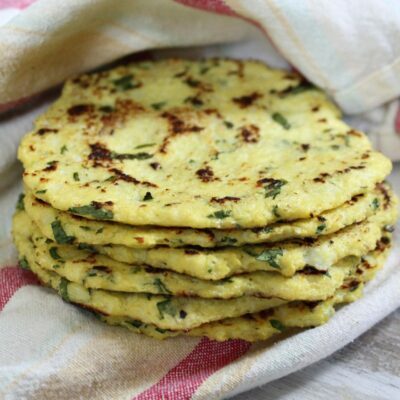 These are just fine when made a couple of days ahead- just keep them refrigerated and then bring to room temperature before serving. *"Scoring the fudge" just means that you are taking a knife and essentially drawing lines in the top to show where you will eventually cut it. It's great to have a guide to make things even and easier to follow. *If you'd like each piece of fudge to be uniform and neatly cut on "all" sides, cut around the edges of the entire piece before you begin placing the candy corns and scoring. Then you'll get a nice, even cut all the way around (don't forget to wipe your knife after each cut). Apparently I’m ridiculously late, but THANK YOU! 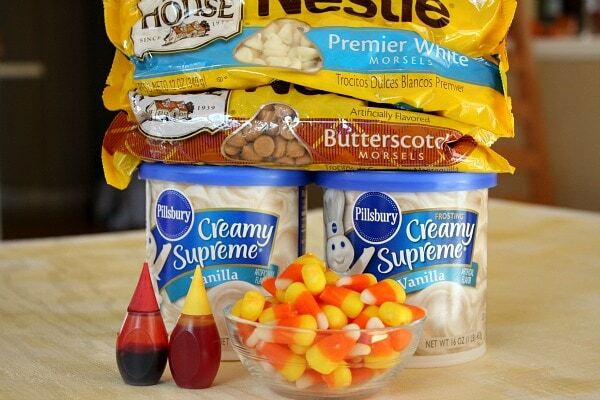 This is one of the cutest Halloween recipes I’ve seen! Too bad I didn’t see them until the day after Halloween! haha. I guess I’ll have to make them next year! Fudge made with frosting?! You you kidding me? This might be the best invention ever!! These are adorable! I somehow don’t own a candy thermometer after years of baking and cooking, so I’m all about fudge recipes that don’t require one! 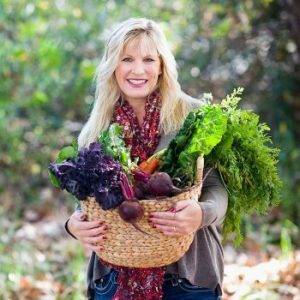 So darn cute, Lori! I have to tell you that it’s a selling point for me that it doesn’t taste like candy corn. Definitely cute! For me the fact that it does’t taste like candy corn is a good thing. Candy Corn!!! Yipeee! Don’t mind if you said they don’ taste like candy corn… as long as they are cute, you are right…They will definitely be a blast! Thanks on your tip on the vanilla chips. Great post!